Just Taylor: Haul part two; Skincare. Hi guys! Last week I posted the first half of my haul which included all of the makeup items and as promised, I have made a second post to discuss the skincare items that I bought! If you read my last blog post which was the first half to this haul which you can read here, you will be aware of the hassle of offers launched at me as soon as I stepped foot into The Bodyshop. As well as the cosmetics that I bought in there, I also picked up a papaya body wash that was reduced to £3. I can't even explain to you how lovely this smells (I think it's time technology advanced and a smelling device was installed into our computers). I'm afraid Debenhams was the exact same, as soon as I walked in there was a lot of stalls with reduced items on. 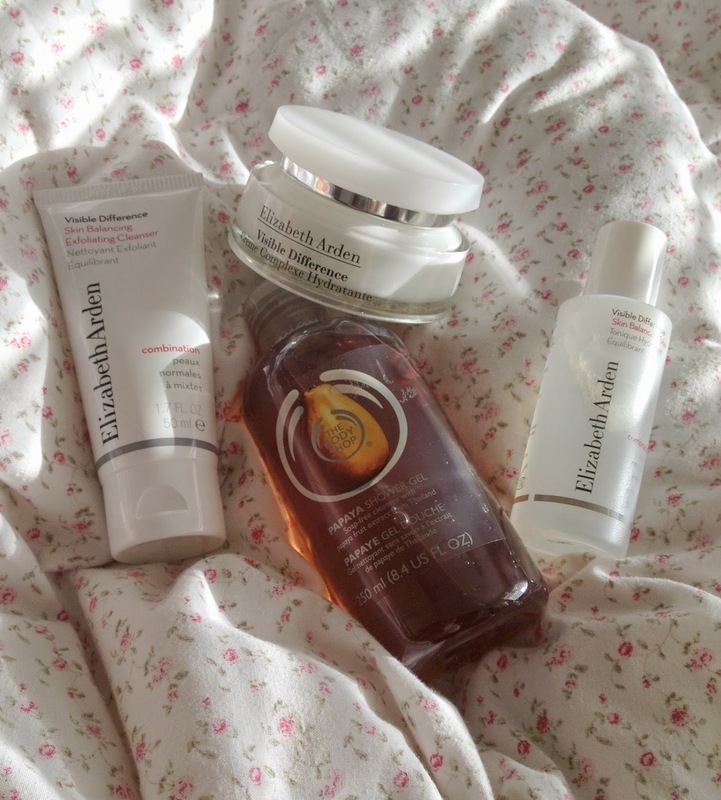 As I needed new skincare, I spotted two reduced Elizabeth Arden items. The first was a set that included a toner and a exfoliating cleanser which was reduced to only £8, and the second was a moisturiser that was reduced to £15. I obviously couldn't resist and purchased both. I've been using these for the past week and they have been doing my skin wonders! The only issue that I have is that the moisturiser does not smell nice at all, however it does it's job sufficiently. If you would like me to review any of these products, leave a comment below and I will make a post on which item you want me to review.